Growing adoption of Robotic Process Automation (RPA) in back-office processes can be traced to its inception. According to Blue Prism Group Plc., a pioneer of RPA, till the first half of FY2018, over 1,000 organizations have used the platform. 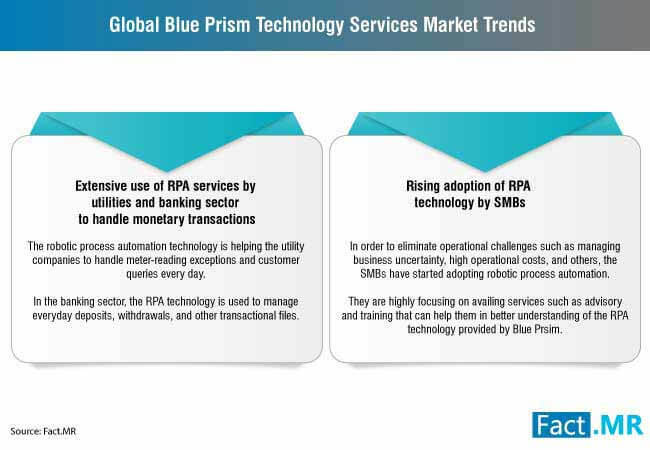 Amidst the emergence of several new competitive technologies in the RPA market, adoption rate of the Blue Prism technology is on the rise. Blue Prism’s consistent development in terms of ecosystem expansion, continued product differentiation and talent acquisition are driving new users to the platform. Increasing success stories of faster deployment and increased return on investment are also driving the adoption among key end-users. Initially limited to automation of repetitive processes in the back-office, integration of AI and cognitive technologies in the Blue Prism Technology are delivering next-generation RPA solutions to clients, in turn, strengthening the presence in the RPA market. As a mounting number of end-user businesses coupling RPA tools that are integrated with AI and cognitive services, players in the Blue Prism services are focusing on targeting specific end-user industries to envisage rapid growth. Addressing the industry-specific end-user requirements while developing various Blue Prism technology services is emerging as a popular trend in the Blue Prism technology services market. Recently, the University of Manchester partnered with a Blue Prism Group Plc. to launch Blue Prism’s Global Academia Program that uses Blue Prism technology services to help computer science students to build RPA projects at global scale. Furthermore, growing needs for RPA solutions in the banking and finance sector is encouraging companies, such as Accenture plc., to develop Blue Prism technology services suiting end-user needs for digital finance applications. New avenues of growth opened by the global value chains (GVCs) and digital industrial transformation is spawning a huge population of small and middle-sized enterprises (SMEs) that employ automation technologies, such as Blue Prism technology services. Increasing participation of SMEs in diverse industrial sectors is facilitating spillovers of Blue Prism technology services to improve productivity and reduce costs. 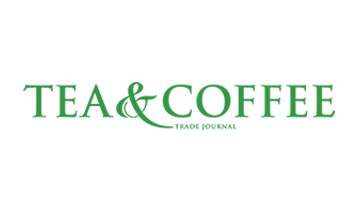 Additionally, governmental organizations, such as Organisation for Economic Co-operation and Development (OECD), are focusing on the growth of SMEs by making business innovations, such as Blue Prism technology services, more accessible to SMEs. As Blue Prism technology services help SMEs to improve productivity, reduce costs, and seize lucrative entrepreneurial opportunities, its adoption is likely to increase with the rapidly multiplying number of SMEs across the world. The importance of incorporating automation in various industrial procedures has increased dramatically, as process automation solutions, such as Blue Prism technology services, aid in enhancing business productivity and efficiency. Increasing adoption of industrial automation in developing countries to improve mass production across a wide range of industries remains a major driving force for the growth of the Blue Prism technology services market. Growing incorporation of RPA tools in new application industries, such as Banking, Financial Services & Insurance (BSFI) and healthcare & life science, are influencing vital strategies of stakeholders in the Blue Prism technology services market. End-user businesses that are willing make long-term investments in industrial automation are expected to provide a major boost for the growth of the Blue Prism technology services market in the upcoming years. Fact.MR report provides readers with detailed information about leading vendors in the Blue Prism technology services market, such as Blue Prism Group Plc., Accenture Plc., Deloitte Touche Tohmatsu Limited, Ernst & Young LLP, Avanade Inc., Agilify Automation, Virtual Operations Ltd., Neoops Inc., Dirwa, and Quanton Limited. The report feature critical information including Blue Prism technology service company overview, key financials, product offerings, region-wise presence of the company, and SWOT analysis of each Blue Prism technology service vendors, to help readers to track the strategic developments of their competitors in the Blue Prism technology services market. Blue Prism Group plc. 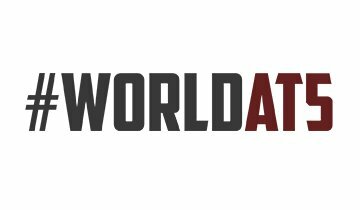 recently established a strategic collaboration with Microsoft to provide its customers complete access to not only Microsoft’s expertise and advice, but also Microsoft’s next generation AI technologies. 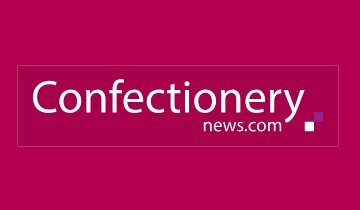 The company is planning to deliver exclusive Blue Prism technology services to its customers to help them incorporate intelligent automation and integrate digital workforce with cognitive solutions. The company also partnered with leading independent software vendors (ISV), such as TimelinePI, Ephesoft Inc., and XpertRule, to expand the ecosystem of its best-in-class Blue Prism technology service providers including Robotic Process Automation (RPA). Another player in the Blue Prism technology services market – Accenture plc. also announced to have expanded the capabilities of Accenture myWizard, Accenture’s intelligent automation platform that integrates AI solutions and tools, including Blue Prism technology services. Other vendors in the Blue Prism technology services market, such as Deloitte Touche Tohmatsu Limited and Ernst & Young LLP, are putting their efforts into establishing their expertise in Blue Prism technology by acquiring various certifications. Unprecedented growth of the Blue Prism technology services market is attracting a mounting number of vendors to enter the market, making it a highly competitive and fragmented marketplace. Blue Prism technology services are developed using Blue Prism technology developed using Microsoft’s .NET Framework. Blue Prism technology services, such as advisory services, training services, and implementation services, can automate various industrial applications. Blue Prism technology services are compatible with various platforms, such as windows and JAVA, and are suitable for a multi-environment deployment model. 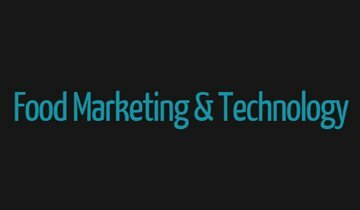 The Fact.MR study concentrates on providing crucial dynamics of the Blue Prism technology services market to help readers to understand the current and future prospects of the market. Qualitative information and estimates about the future growth of the market included in the report are verified with accurate quantitative growth parameters of the Blue Prism technology services market. 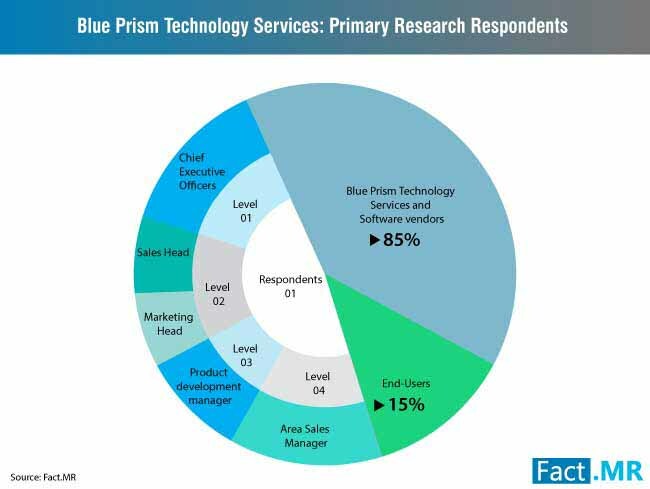 The Blue Prism technology services market is broadly segmented according to geographical regions, service types, enterprise types, and end-user industries. According to the geographical regions, the Blue Prism technology services market is segmented into four regions – North America, Latin America, Europe and Middle East & Africa (EMEA), and Asia Pacific (APAC). Based on the types of Blue Prism technology services, the Blue Prism technology services market is segmented into four types of services – advisory services, training services, maintenance and support, and implementation services. According to the enterprise size, the Blue Prism technology services market is segmented into SMEs and large enterprises. 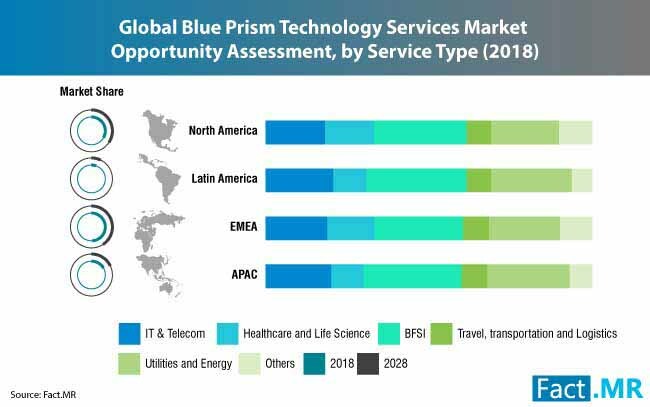 By end-user industries, the Blue Prism technology services market is categorized into leading end-user industries of Blue Prism technology services, including IT & Telecom, healthcare and life science, BFSI, travel, transportation, and logistics, and utilities and energy. Which factors are driving growth of the Blue Prism technology services market markets in developed countries? What are the major strategic developments that are aiding Blue Prism technology services market leaders to envisage rapid growth in the market? 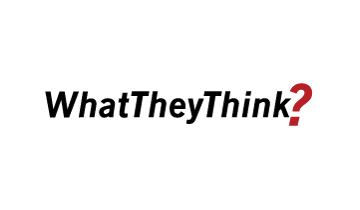 Which end-user industry accounts for the largest share in the Blue Prism technology services market? What are the factors restricting the expansion of the Blue Prism technology services market? 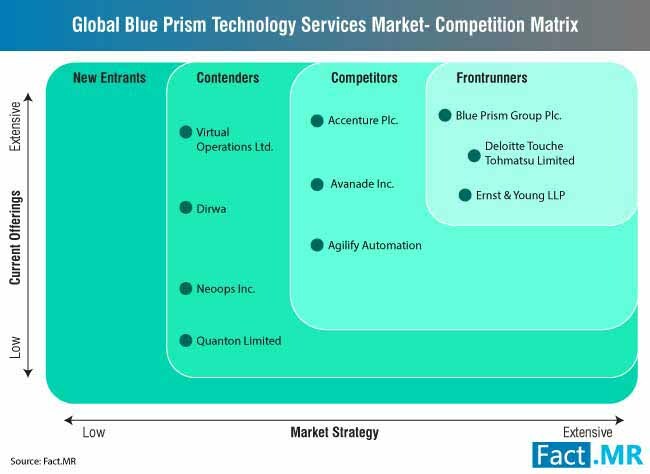 What are the winning and losing components for various market segments that are impacting the Blue Prism technology services market growth? A holistic approach is adopted by analysts at Fact.MR while conducting a thorough research on the growth of the Blue Prism technology services market during 2018-2028. These conclusions are obtained at the end of detailed secondary and primary research on the Blue Prism technology services market. In-depth secondary research helps analysts to fathom the historical and recent data about the Blue Prism technology services market. Secondary research is followed by primary research, where analysts interview all the leading players in the Blue Prism technology services market. Conclusions featured in the report about the expansion of the Blue Prism technology services market are accurate and unique. Fact.MR ensures the accuracy and reliability of all the information associated with the development of the Blue Prism technology services market during the forecast period. 11.1. Blue Prism Group plc.